World speedway champion Tai Woffinden took his second consecutive Grand Prix victory of the season tonight to move into pole position in the title race. The 23-year-old Brit blasted around the outside of American Greg Hancock on the first lap of the crucial final to win the race by a distance and take the GP win in Malilla, Sweden. 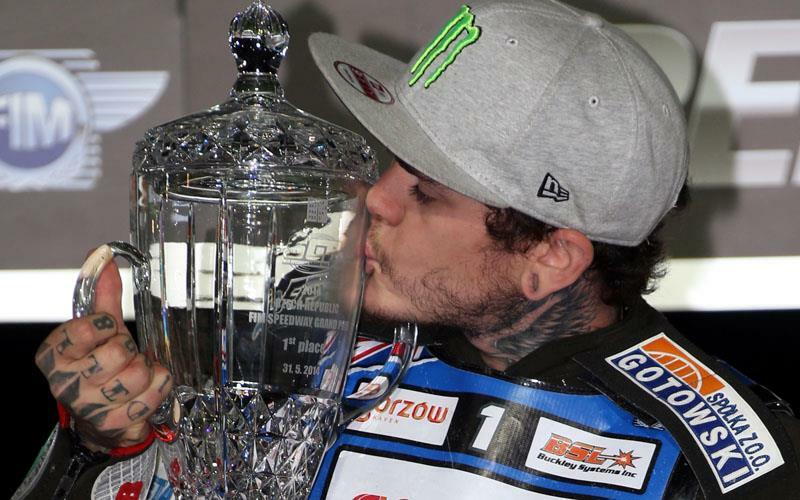 The victory left Woffinden one point clear of Hancock in both the scores on the night and in the world championship standings after five of the season’s 12 rounds. The defending world champion is on an even better run of form than he achieved in his title-winning 2013 campaign. After a dismal start to his title defence, leaving him in 13th place after two rounds, he has now top-scored in each of the last three races. The meeting in Sweden saw the series return to its entertaining best after a pair of relatively processional meetings in Finland and the Czech Republic. Third place behind Woffinden and Hancock went to 2012 world champion Chris Holder from Australia, with Poland’s Jarek Hampel rounding out the night’s finalists. There was controversy in the night’s second semi-final when Nicki Pedersen was judged to have caused Slovenian Matej Zagar to fall on the final turn. An enraged Zagar pulled himself from beneath the air fence to shove Pedersen, who had casually picked up his bike and was about to ride away, having shown no concern for his fallen rival. Pedersen then kicked out at Zagar in a confrontation that continued when the pair returned to their pit bays. Woffinden’s fellow British rider Chris Harris scored his first race win of the season so far, but his five-point score wasn’t enough to make the semi-finals. Harris remains the lowest-scoring rider of the 15 GP regulars in the series standings. Woffinden and Harris will both attempt to become British speedway champion at Wolverhampton on Monday night, June 16.